I never know what people are going to suggest when I ask them for something new or rare that they’d like to share: it differs from band to musician and it’s generally – and importantly – nothing like I’d ever expect. Most of all I love the stories, getting to know how a track or an artist which could easily have been missed is discovered and becomes important to someone. The first time I heard Tommy Johnson’s Cool Drink of Water I was eighteen and it hit me like a brick. It came during an intense period of discovering and listening to the pre-war blues of Blind Willie Johnson (no relation) and Skip James, me – a perpetually stoned teenager sulking about Falkirk as it was The Delta of Central Scotland. I suppose it was like that for a lot of white middle class British kids, then and now. I bought a slide and invented a new genre: thrash blues, a hybrid of Willie Johnson and Nirvana. We would lie on the roof of an abandoned hospital on weekend nights, getting drunk on red wine, endlessly smoking cigarettes while arguing about who was better – Dr. Dre or Slint. Through these hissy, primitive, archaic blues recordings though, we heard a truth and authenticity that punk rock could only scratch the surface of. Voices so raw and disenchanted and haunted they were practically unlistenable. Out of the whole Delta Blues cannon, what is it about Tommy Johnson’s song that sits above the rest? It must be his ghostly falsetto, the melancholic chords and funeral pace of the song, the tremolo solo over the verses, the allusion to Satan or being lost and far from home. But probably most of all it is the fact that it sounds like music from another world, intangible and alien rising slowly through a dimension from somewhere absolutely forgotten. Not much is known about Johnson other than he was an alcoholic who made bad decisions in the music industry, was the possibly the first guitarist to play behind his head and he gave Canned Heat their name (after one of his songs). It is also reported that he sold his soul to the devil to gain prowess on the guitar – a tale he would gladly tell others, perhaps to enhance his stage persona. This myth was later inherited by Robert Johnson’s legend, who bore no relation to Tommy. 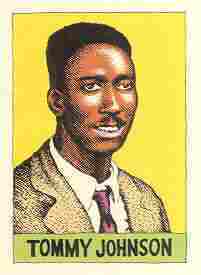 He was loosely portrayed by Chris Thomas King in the Cohen Brother’s film O’ Brother Where Art thou? in 2000. Adam Stafford’s most recent release is a split single with Rick Redbeard of Phantom Band fame and released on Gerry Loves Records…listen to ‘Vanishing Tanks’ really loud, it’s all spurts of air and cut through vocal – ‘Russian Glass’ is a cinematic, straightforwardly stunning song. Stafford’s solo album Build a Harbour Immediately should be listened to on rotation, swooping from upbeat vocal loops – see ‘Shot-Down You Summer Wannabes’ – to delicate melodies – ‘Build a Harbour Immediately’ – and poignant lyrical work – ‘Fire and Theft’ and ‘Temple of the Holy Ghost’. I guarantee it will take you by surprise.